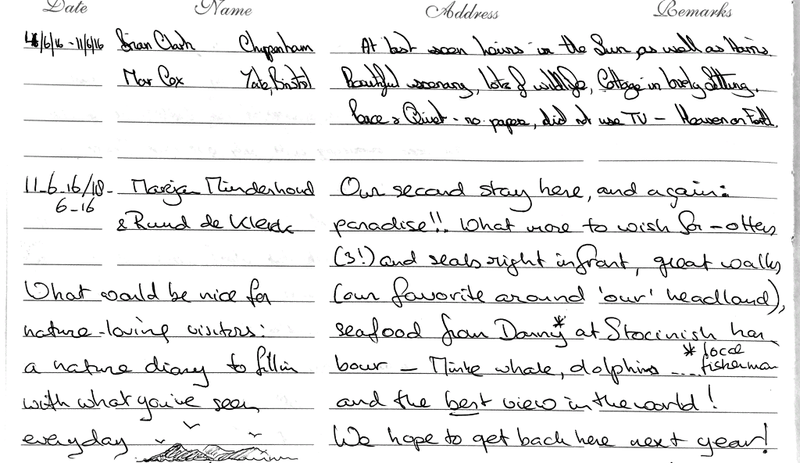 We take great pleasure when we read the positive comments about Cluer and Harris in our visitors book. Thank you for those who e-mail at the end of their holiday with such positive comments. Initially, when we started letting the house we had mixed feelings about allowing others into our family holiday home but now that we know that others are deriving the same kind of pleasure as we do on escape to the Western Isles, we find this very satisfying. 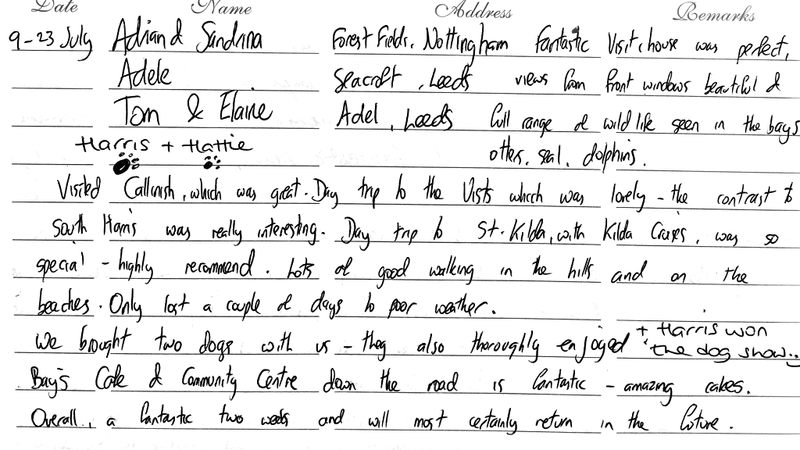 Thank you for a lovely stay! Great house with stunning views. We have visited Harris many times previously, however this trip was extra special as our son/brother was getting married at Rodel Church on Saturday 4th July! We have had a thoroughly enjoyable, exciting trip, visiting our much loved favourite places, travelling around the island, walking, meeting new people. Thoroughly recommend the Skoon Art Gallery (Cafe) and the Mission House Art Studio (both not far from here). Watch out for the seal family in the bay as well as an adorable otter! Thank you! 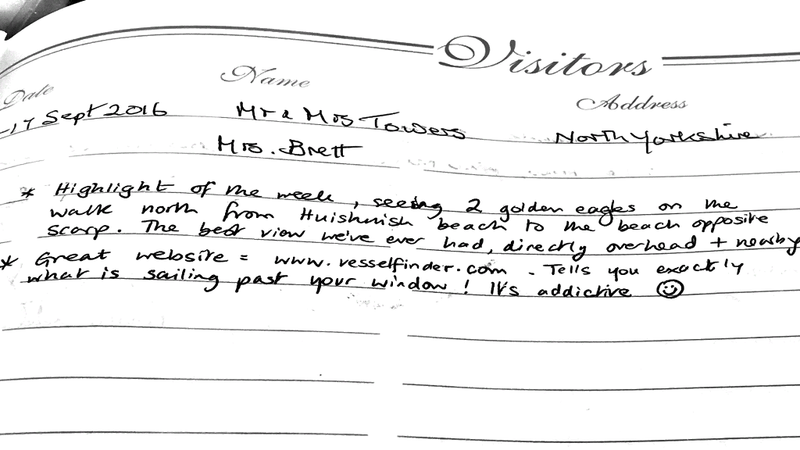 Thank you for this gorgeous experience and these 'mind-opening' views this fantastic house offered. Will come back definitely if allowed to. ​Lovely house, had a great time the 9 of us. View fantastic, Shirley the caretaker very helpful. Thank you, Monique and the rest of us. Another enjoyable stay at Cluer. Very comfortable and well equipped. An amazing week far exceeding our already high expectations. Harris is a stunning place and the cottage in its dream location has been a very comfortable and ideal base from which to explore. The weather cancelled the trip to St Kilda but Berneray was a wonderful 'plan B'. Thank you for allowing us to use your beautiful cottage. Hope we can come back!! Thank you for sharing your home with us. Fantastic holiday! ​Our first trip to Harris and the perfect base for exploring the island, and nice and close to Tarbert. A beautiful house, ideal for relaxing when we returned from our many and varied day trips. Great to come 'home' again - to relax and enjoy our holiday on a well loved island - a restful, serene abode. Thank you so much.